David Sandum, an artist living in Moss, Norway, organized a Twitter Art Show to benefit the library. Since Twitter uses 140 characters in each tweet, he decided to ask 140 Twitter artists to participate. Each painting is the size of a 5″ x 7″ postcard and should produce a delightful and varied show of works from many different countries. 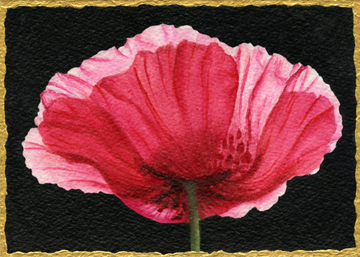 The backlit poppy silhouette shown here is my contribution to the show, a mixed media work. The poppy is painted in watercolor and the black and gold in acrylics. I varnished the piece to make it easier for handling when they display the works in the library. I am happy to participate in such a worthy and interesting project! This entry was posted in Art Paintings and tagged ACEO, acrylic painting, poppy, poppy painting, twitter art exhibit on November 8, 2010 by Lexi Sundell.